The place to go? 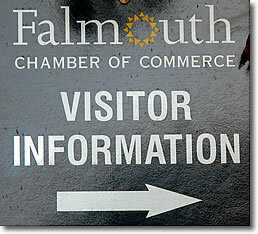 Falmouth Chamber of Commerce. The Falmouth Chamber of Commerce operates an information office downtown off Main Street in the graceful old Lawrence Academy building (map). If the chamber staff can't answer your question, it's probably not about Falmouth.